Dutch Super Cup betting tips, predictions and previews - Winning picks and selections from Dutch football experts. 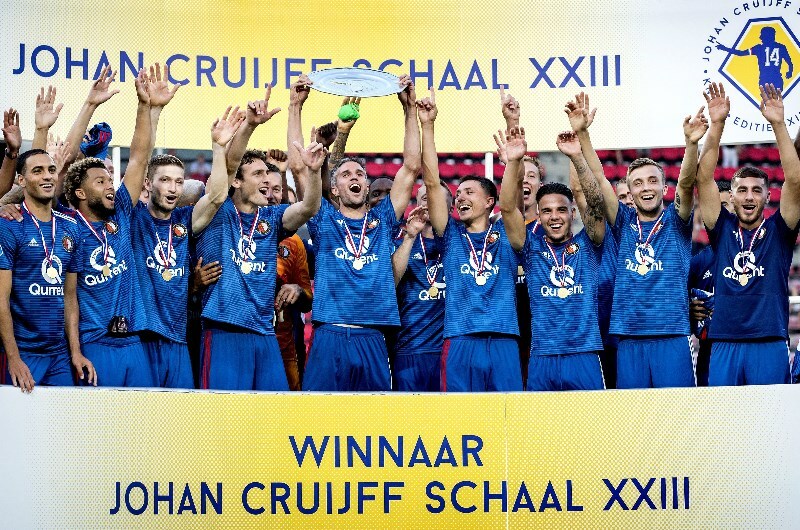 The Dutch Super Cup or Johan Cruyff Shield is a trophy awarded to the winner of an annual football match in the Netherlands. The single match is contested between the winners of the Eredivisie and the Dutch Cup (KNVB Cup). The match is the traditional curtain raiser for the Dutch football season and is normally played in August one week before the start of the Eredivisie. If one club wins both the Eredivisie and the KNVB Cup, the Johan Cruyff Shield is be contested between the Eredivisie winners and runners-up. The competition is named after Dutch football legend Johan Cruyff, winner of the Ballon d'Or three times in 1971, 1973 and 1974 and regarded as one of the greatest players in football history. Cruyff became a manager after his playing career, helping to revolutionise the game with a football philosophy known as Total Football. The inaugural Dutch Super Cup was played in 1949 at the Goffertstadion with league champions SVV defeating cup winners Quick Nijmegen 2–0. The Dutch Football Association revived the competition in 1991 as the PTT Telecom Cup with the name Super Cup reinstated three years later. The Dutch Super Cup has been known as the Johan Cruyff Shield since 1996 and is played at the Amsterdam ArenA. One of the most famous matches in Dutch Super Cup history occurred in 2004 when FC Utrecht beat Ajax Amsterdam 4-2 after trailing 1-2 in the 85th minute. Starting from 2017, the Dutch Super Cup has been played at the stadium of the Eredivisie champions. On that occasion Eredivisie winners Feyenoord defeated Vitesse in a penalty shootout at De Kuip Stadium in Rotterdam after the match finished 1-1 after 90 minutes. PSV Eindhoven have won the most Dutch Super Cups with 11 titles, Ajax Amsterdam next best with eight Johan Cruyff Shields to their name. Feyenoord have won four Dutch Super Cups including wins in 2017 and 2018. FC Twente have won twice with one title each to FC Utrecht, AZ Alkmaar, SVV and PEC Zwolle. Feyenoord are the defending champions having defeated PSV Eindhoven in a penalty shootout after the match ended 0-0 at the Philips Stadion in Eindhoven.